If you’ve been reading my blog for a while, you know that I like to make fun birthday cakes for my kids. Before you start feeling guilty for not making fun birthday cakes for your kids, don’t, because I promise there are plenty of other things you do as a parent that I’m failing at. If, however, you are like me and making fun birthday cakes is your thing, I do like to share my cakes with you so you can steal my ideas! 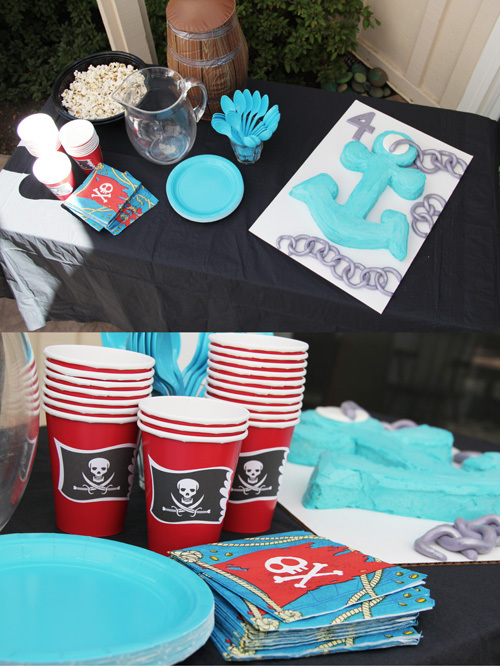 Owen had a pirate themed birthday party this year and he decided he wanted an anchor cake. Nate and I tried to talk him into a pirate flag cake. That would have been SO EASY…just a 9×13 cake with black frosting, topped with a fondant skull and crossbones rolled out and cut into the right shape…if only. But alas, he wouldn’t go for it. Anchors away! 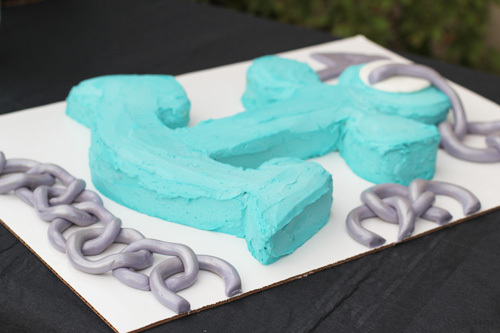 At first I thought an anchor cake would be easy peasy. Shaping the cake was in fact simple, However, frosting the cake was WICKED HARD. So many nooks and crannies around the edge! My frosting skills were no match and this was my worst-frosted cake ever, but it still looked cute enough and 4-year-olds surprisingly don’t notice these things. 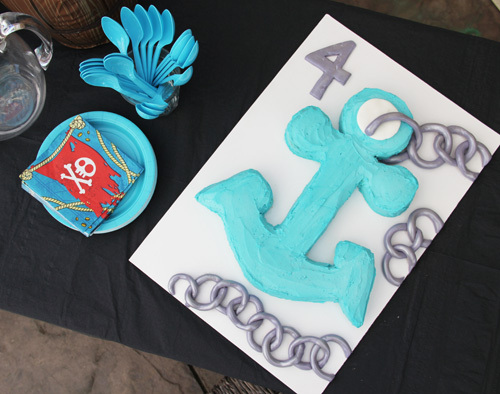 Here’s how to make an anchor cake! Bake a 9″ x 13″ cake. …use the large cake scraps to shape pieces to round off the top of the anchor and add to the arrow-shaped sides. For the chain, I mixed black food coloring into white fondant to make grey. I rolled out skinny snake shapes and linked them together. The final touch was to lightly brush the chain with metallic edible silver dust from Wilton. That was Anna’s idea and it made the chain look AWESOME. I rolled out a thin white disc for the hole in the top of the anchor where the chain is attached. Click here for my comprehensive “Amateur’s Guide to Making Super Cute Cakes,” which includes a recipe for chocolate cake and buttercream frosting as well as LOTS of tips for shaping and decorating cakes. And, because I’ve never shared it before, below is the recipe for vanilla cake we use, which was what Owen requested. This recipe comes from my favorite cake book, Cakes for Kids by Matthew Mead. The book is out of print but there are copies on Amazon. The best part of Owen’s cake had absolutely nothing to do with the cake. The wind blew out his candles while we were singing. Nate quickly relit them all, then the wind blew 3 of the 4 candles out again. Nate went to relight them AGAIN. Instead Owen just rolled with the punches and blew out the one candle. 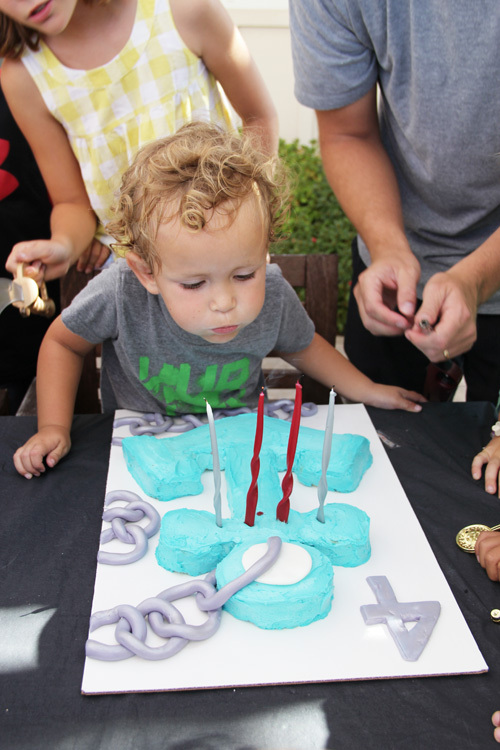 It was super cute, although I suspect that he knew 1 candle was easier to blow out than 4. Crafty guy.